The Aquatec Bath Lift is a latex-free, battery-powered bath lift that will safely and easily lift and lower people into and out of the bath tub. The Aquatec Bath Lift can be used with children age 3 years to adult with special needs. The Aquatec Bath Lift is capable of supporting up to 300 lbs. (136 kg). The Aquatec Bath Lift folds uniquely to the size of a small suitcase for storage and transport. The basic Aquatec Bath Lift weighs only 32 lbs. (14.5 kg) so transporting it in and out of the bathroom and the trunk of the car for vacations is a snap! Simple to use, the Aquatec Bath Lift, lowers and reclines with the touch of a button. Simply charge the battery and insert it into the back support. With a fully charged battery, you can get up to 22 bath cycles on one charge. With a light touch of the button you can raise or lower yourself 2.5" from the tub floor. 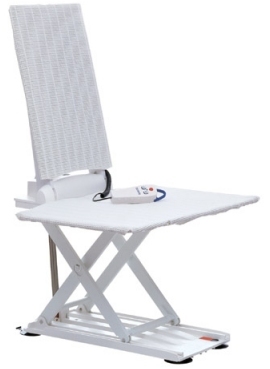 The backrest can be reclined 40° for additional trunk support or simply to shampoo. New to the Adaptivemall.com from Columbia Medical®, the Spirit™ Adjustable Positioning System™ (APS™) Car Seat is unique to the special needs car seat market by being the first car seat offering swing away trunk and hip supports. The exceptional positioning options that the reclining Spirit™ APS™ car seat offer liken the trunk and head support features to that of a more intricate and custom designed wheelchair seating and positioning system. Please note: The Columbia Medical® Spirit™ Adjustable Positioning System™ (APS™) Car Seat requires the use of the Dual Hook Tether Strap for an up charge to ensure safe and proper use. ONE Tether HOOK is required for users between 25 & 79 pounds. BOTH Tether HOOKS are required for users between 80 & 130 pounds.For children with special needs that are unable to sit upright without support, the Columbia Medical® Spirit™ Adjustable Positioning System™ (APS™)Car Seat provides cushioned support as well as a recline bar feature to increase postural stability for children with mild to more severe physical involvement. The Spirit™ (APS™) Car Seat special needs car seat is positioned at 98 degrees from the upright, offering a slight recline for children with minimum trunk involvement. With the standard recline bar, the recline angle increases an additional 30 degrees from the upright for maximum head and trunk support for children with special needs who are unable to hold their head and trunk upright without assistance. The low profile cushioned wall supports facilitate easy transfers in and out of the special needs car seat. The optional swing away bracket mechanisms (sold separately) can be outfitted with varying sized positioning pads (also sold separately) to increase the amount of support provided at the trunk and pelvis for unparalleled postural stability. The Adventurer Tandem is a tricycle built for two. From the rear of the tricycle, the driver steers, brakes, and controls the 8-speed gears. The rider in the front, no matter his or her ability level, can enjoy all the benefits of cycling. The Adventurer Tandem 40" rear stance gives you all the support you need. This model is targeted towards riders from 7 years of age and up to accommodate both the rider and the driver. The Adventurer Tandem offers several standard features with an added dimension of support and comfort for young adult riders. The handlebars, seat and crank mechanisms are adjustable. Adventurer’s walk-through design and step-on platform decrease obstacles for transfers on and of the tricycle. The Adventurer 26" is one of Freedom Concepts larger models. The Adventurer’s full 34" rear stance gives you all the support you need. And with the larger wheels, traversing over uneven terrain is made easier. This model is targeted towards young adults, ages 12 to 20+ years. The Adventurer 26" offers several standard features with an added dimension of support and comfort for young adult riders. The handlebars, seat and crank mechanisms are adjustable. Adventurer’s walk-through design and step-on platform decrease obstacles for transfers on and of the tricycle. The Adventurer 26" has two rear band brakes for safety. The hand controls for the band brakes are mounted on the handlebars for the rider to operate. If the rider needs assistance operating the brakes, one or both of the controls can be mounted in the rear of the tricycle on the assistance handle or the optional rear steering handle. The Jensen ADA Swing is a swing seat for children and young adults with special needs. The swing can be reclined at varying levels to provide as much support as your child would need. It is durable for both indoor and outdoor use. The Jensen ADA Swing has built-in support. The Jensen ADA swing has large armrests as well as a large footrest to accommodate a range of sizes of children. The Jensen ADA Swing meets ASTM, regulations that cover swings for all children. The Jensen ADA Swing has an overhead yellow yoke so that every child that uses the swing will have some level of support. The Jensen ADA Swing also has holes where an Optional Webbed Harness can be attached if your child requires more support to maintain a seated position in the swing. The locking mechanism for the yoke was developed to stop pinch points and is very secure. All of the hardware, except the attaching chain, is stainless steel to prevent rust. The point where the eye bolts attach to the Jensen ADA Swing has special reinforcement to help prevent breakage. The Kaye Anterior Chest Support Walkers with Forearm Supports were specifically designed for children who are able to support weight on their legs and take steps, but lack the ability to use the upper extremities for walking with more traditional walkers. The Chest Support walkers are a wonderful tool for assisting children with more severe levels of spasticity, spastic-athetosis, or ataxia. The Forearm Supports allow users to use upper extremity support to walk when they are unable to grip the handle securely. The AmTryke ProSeries tricycle was specifically designed in response to therapists' requests for a more traditional style tricycle for children with special needs, up to approximately 15 years old. 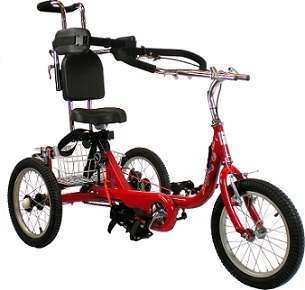 The ProSeries tricycle is recommended for children with mild to moderate levels of physical disability who have low muscle tone, as well as decreased strength and endurance. Optional accessories can be added to increase support at the head, trunk, pelvis and feet as needed. Fitting a wide range of children with special needs, the ProSeries tricycle comes standard with three foot crank positions and four seat post positions. This adjustability allows for years of growth for the tricycle for a child OR for use with multiple children of varying sizes. The positive drive action foot crank mechanism maximizes therapeutic benefits for children in therapy clinics, school, or at home. The Wenzelite Nimbo Walker – Adult can be a Posterior Walker OR an Anterior Walker. The Posterior position places the walker behind the user as they stand and move. A Posterior Walker is designed to help users stand in an upright position. The Anterior position places the walker in front the user as they stand and move. An Anterior Walker is designed to give a sense of security in front of the user. Anterior Walkers can also be used with the Forearm Prompt Accessory for the user to “lean” on to help them move around if the user has minimal to moderate balance control and/or cannot grab a handle bar. The XL Rifton Pacer Gait Trainer is a great solution for adults to achieve independence. For those that need assistance to walk, the XL Rifton Pacer Gait Trainer provides the right amount of support for each individual. Traditionally the Rifton Pacer has been used in school setting for children with disabilities. Many therapists requested that Rifton make this newest size so that the Rifton Pacer could be used in rehabilitation centers for individuals who have experienced strokes, TBIs and various other disabilities that make walking difficult. The XL Rifton Pacer Gait Trainer Frame can adjust in height to adjust to different patients that are in rehabilitation centers. It can also provide room for growth if needed. There are several accessories to choose from to provide support where it is needed. Once the correct set up is identified, independent ambulation becomes a reality for so many.